I was the absolute worst at spilling things on my clothes. Ketchup, salad dressing, pasta sauce. If it could spill – I would spill it. Since I had started buying my own clothes at that point, I was so excited there was a product that could finally get those tough stains out and be a hero to my favourite shirt, so it could see another day outside the closet and not be put to pasture as a dust rag. If you have never used OxiClean Versatile Stain Remover Powder you should – it can save your clothes and so much more! The original oxygen-based stain remover also handles carpet stains, upholstery stains, even stains on hard kitchen and bathroom surfaces. A couple of months ago Chris and I became homeowners. Hannah’s room was white and Maple Leafs blue (I’m not kidding – the old owner was a big fan). So we decided to paint her walls Sugar Plum – a pinky purple. Less man cave, more child’s haven. We also decided to install mirrored closets to make the room look bigger. The carpet in her room is blue (no big surprise), therefore when using white paint for the borders it was quite clear where our drop cloth let us down. I have a feeling OxiClean will save us a LOT over the next few months as we put a personal touch on the condo, making it ours. And over the next few years, having a child and a cat who both love to make messes – especially on the couch. OxiClean Versatile Stain Remover Powder has over 101 uses on multiple surfaces like carpet, upholstery, kitchen and bath surfaces, and even works outdoors on gutters, unfinished decks, and patio furniture. Oxiclean is an incredible oxygen-based stain fighter that’s chlorine free and colour safe. OxiClean can be purchased nationally at Walmart and Shoppers Drug Mart. If you have a baby or a toddler, be sure to pick up some OxiClean Baby Stain Remover Spray. It was the only product that helped us get out formula, baby food and yes, even poop stains from Hannah’s clothes. It really saved her wardrobe when she started daycare. For more stain-fighting tips and tricks, visit OxiClean on Facebook. 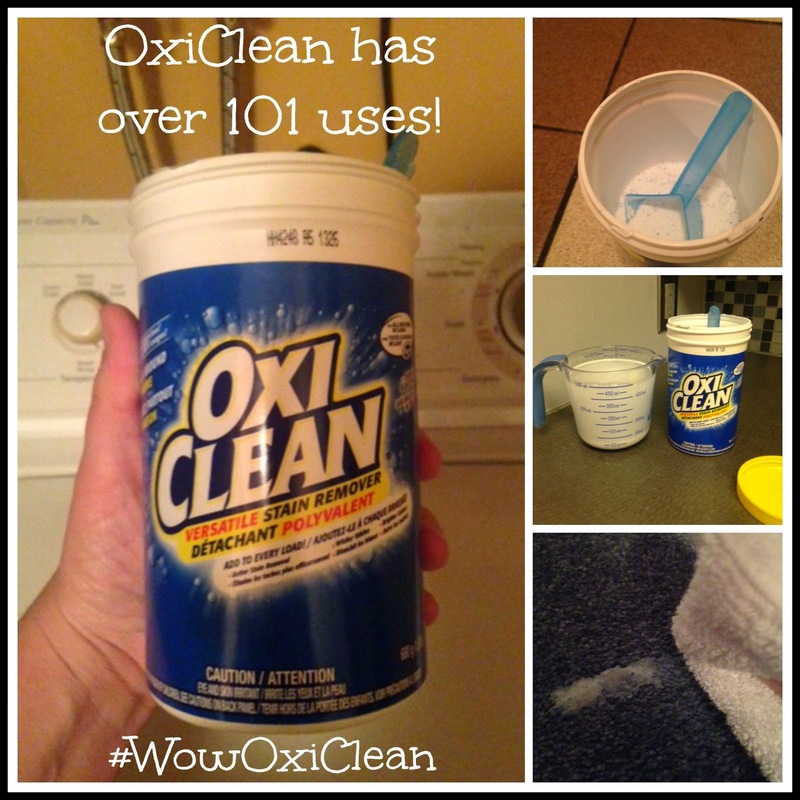 How do you use OxiClean in your home? This post was brought to you by OxiClean Versatile Stain remover, however the images and opinions are my own. For more information please visit http://oxiclean.ca/. Oxiclean is a wonder product! We use it for really long time for stubborn stains and our clients are really happy! Thumbs up for Oxiclean! Greets, Kenley Carpet Cleaners Ltd. I am really impressed by how many different stains Oxi Clean can handle! I have never tried it but I am searching for stain removers on the Internet lately and I read wonderful comments about OxiClean Versatile Stain Remover Powder. I am interested mainly in carpet cleaning so I would love to try it! Thanks! Cleaners Up Ltd.